After nearly a month of my frigerator being on the fritz and the warranty repair guy unable to fix it after three visits, Home Depot decided to refund the price of the refrigerator and call it done. Normally this might piss me off - an extended warranty is supposed to make things right if something goes wrong, and here I'm out a refrigerator for a month and I'm something like $150 in the hole because of the cost of the extended warranty. But I knew the repair guy was fairly incompetent and was happy to have him finally give up on it. I read up online on refrigerator repair for my make and model and in a couple hours had debugged my refrigerator problems and ordered the parts for $70. Yes, he was really that bad. The parts were due to arrive sometime this afternoon so I spent the middle part of the day on a long bike ride. 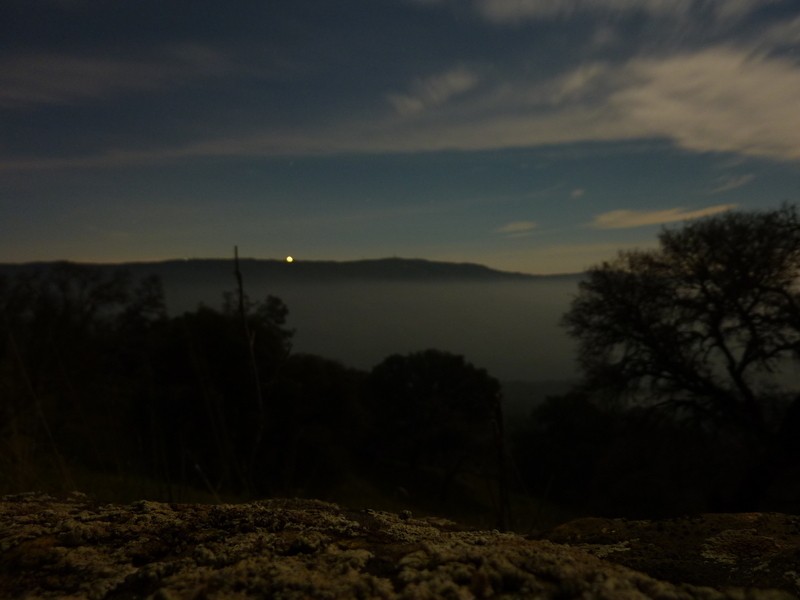 While I was out riding it occurred to me that if I were to able to fix the appliance today, I could probably go out for a moonlight hike in the Napa area and hike the next day as well. A weather system was due to bring precipitation to the state starting Thursday, so I had a small window of good weather remaining in the week. I would need a lot of things to go right to pull this off. I was happy to find the parts on my doorstep when I got back from my ride and speedily went about replacing the evaporator fan. It took about two hours to complete the repair and to the amazement of my family who tend to doubt my refrigeration skills, it worked. I then went about downloading GPS route info, paying a visit to the grocery store and getting my gear ready. After dinner I dropped my daughter off at her volleyball practice and jumped on Interstate 880 heading north up the East Bay around 7p. It had been a busy day and I hadn't even gotten to the hiking, but I was on a roll and well-caffeinated. Junior BM is a P900 located about 10mi northeast of the town of Napa that can best be accessed from SR121. A good paved road, Longhorn Ridge Rd, runs nearly to the summit but it is private and signed for No Parking. There are several estate homes off this road, easily visible from the summit ridgeline. I chose to start off SR121 where it goes over a saddle directly across from another ranch home located on the west side of the highway. A gated dirt road heads east up towards Peak 1,529ft which would be a bonus summit on my way to the main goal. The one-way distance for the route is around 3mi. The temperature was about 45F when I started, a full moon high overhead with thin clouds over much of the sky. The area appears to be primarily used for ranching, a good thing in this case, as the cattle have kept much of the thick chapparal that might otherwise cover these hills at bay. I followed the dirt road up the slopes heading east, leaving it where it turns to the north to climb a steep, grassy slope before picking up another road higher up. This second road leads to a saddle just southwest of Peak 1,529ft. Another short climb up grassy slopes leads to the summit, crowned by a large oak. Having climbed some 400ft to reach the bonus peak, I then had to drop that same amount to reach a meadow at another saddle with the main summit. Up until this point, roughly half way, I had been confident that the route would be easy. At the summit ridge I would be able to pick up more ranch roads for easy travel, but the 800-foot climb to reach it from the saddle was an unknown. The satellite view shows oak forest, but the understory was uncertain. I was happy to find that the cows have grazed these slopes to keep them mostly brush-free. The biggest concern I had while climbing it was the possibility of running into poison oak in the dark. In a few places where I suspected the stuff, I turned on my headlamp for better vision - there was indeed some poison oak, but it did not appear to be widespread and I think I was able to avoid it (keeping my fingers crossed as I write this the next day). Somewhere on the slope I had to cross a barbed-wire fence (one of several on the evening), but it was poorly maintained and it was easy to crawl under it.